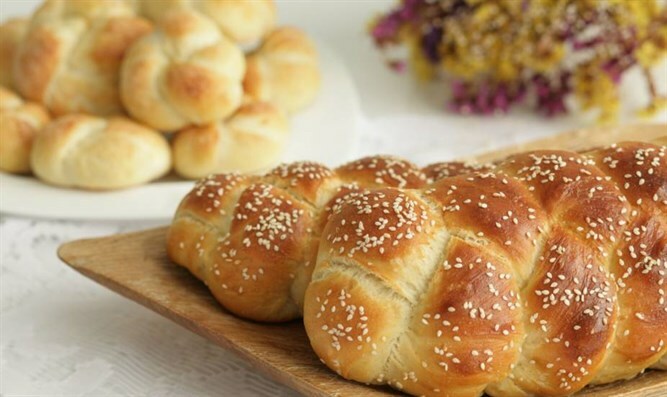 There is no more mouthwatering smell than that of challah baking for Shabbos! Place yeast into a small bowl with one-fourth cup sugar and one cup warm water; set aside until it bubbles. Pour all the ﬂour into a mixer bowl. Pour remaining one and one-fourth cups sugar on top of the ﬂour, to one side. Pour five teaspoons salt onto the ﬂour, on the other side. Add eggs, oil, three cups warm water and yeast mixture. Mix with mixer, until there is room for another cup of water. Add last cup of water. Mix for 10 minutes. Let dough rise for one hour. Preheat oven to 400 degrees Fahrenheit. Separate challah. Turn the dough out onto a lightly ﬂoured surface. Braid into four or ﬁve challahs; place challahs into challah pans. Let challahs rise in pans 45 minutes to one hour. Brush with egg. Sprinkle with seeds. Bake at 400 degrees Fahrenheit for 15 minutes, then at 350 degrees for 15 minutes. Remove from pans and let cool.